Make sure they're in clearly labelled containers from reputable suppliers. Always check for the percentage of active ingredient on the labels. If there isn't one listed, the supplement isn't likely to be effective. Look for the words 'standardised extract' on the label, which guarantees the potency of the active ingredients. To determine dosage, check recommended levels on the product and follow them carefully or consult a practitioner for advice. Also check to see whether the herb should be taken before or with food. 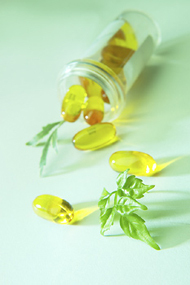 Herb effects may be altered if combined with prescription drugs. Always consult a practitioner for advice if you're already taking medication. Many herbs shouldn't be taken while pregnant or breastfeeding. See the contraindications for each herb for further information. Source: fresh or dried berries. Actions: hormone regulator, progesterone-like effect. Therapeutic uses: menstrual irregularity, PMS (breast swelling and tenderness, mood swings, for example), menopause, promotes breast milk in nursing mothers, boosts fertility. Typical preparation: tablets, liquid tincture. Contraindications: not recommended during pregnancy. Avoid if taking progesterone drugs. Source: gel inside the leaves. Actions: wound healing, emollient, laxative. Therapeutic uses: gel can be applied topically to ease minor burns, scalds, cuts and sunburn. Liquid form can be drunk to soothe the digestive system and protect against ulcers. Bitter aloes, the bitter liquid exuded from the leaf, can be used to treat constipation. Typical preparation: gel applied directly from leaves or collected commercially in a tube; drunk as juice. Contraindications: not recommended during pregnancy. Bitter aloes shouldn't be applied to the skin or taken if suffering from kidney disease or haemorrhoids. Source: fresh or dried roots. Actions: promotes menstrual flow, sedative, anti-rheumatic. Therapeutic uses: traditional Native American remedy for menstrual pain and menopausal hot flushes. Also used to ease arthritic and rheumatic pain due to inflammation and to treat high blood pressure, tinnitus (ringing in the ears), asthma and whooping cough. Typical preparation: decoction from dried root, powdered root in tablet form, liquid tincture. Contraindications: not recommended during pregnancy or while breastfeeding. Actions: antiseptic, diuretic, antiviral, vasodilator (encourages blood flow to the surface of the skin). Therapeutic uses: traditional remedy of the Khoikhoin people of South Africa for treating urinary infections such as cystitis and urethritis. Also used for prostate inflammation, fluid retention and vaginal thrush. Typical preparation: infusion or liquid tincture from the leaves or capsule of powdered leaf. Source: inner bark and roots. Actions: immune booster, antioxidant, antiviral, antibacterial. Therapeutic uses: traditional Peruvian remedy for boosting the immune system to treat and prevent infection. Also used for gastrointestinal disorders such as ulcers, diverticulitis or gastritis, viral and bacterial infections, skin allergies and rheumatoid arthritis. Typical preparation: tablet, tincture, herbal tea, cream. Contraindications: although no serious adverse reactions have been reported, it's best avoided by pregnant and breastfeeding women. Actions: anti-inflammatory, astringent, antifungal, stimulant, diuretic. Therapeutic uses: period pains, digestive irritation, colds, coughs and viruses. Applied externally for skin problems including nappy rash, varicose veins, cuts and grazes, chilblains, fungal infections and insect stings; also used for mouth ulcers. Typical preparation: tincture, infusion, cream. Source: fresh or dried flower heads. Actions: anti-inflammatory, antispasmodic, sedative, relaxant, anti-allergenic. Therapeutic uses: indigestion and irritable bowel syndrome, nervous tension, insomnia, PMS, skin conditions such as eczema, colic and teething problems in babies and young children, hay fever, bronchitis, catarrh, asthma. Typical preparation: infusion taken as a tea or added to bathwater, cream, essential oil. Contraindications: the fresh plant can cause skin rash or irritation. The essential oil isn't recommended during pregnancy. Actions: heals wounds and burns, anti-inflammatory, astringent. Typical preparation: cream/ointment, compress, liquid tincture. Leaves may be used as herbal tea. Contraindications: use is restricted in some countries. Root shouldn't be taken internally. Oil from the leaves shouldn't be applied to open wounds. Actions: diuretic, urinary antiseptic, detoxifying. Therapeutic uses: urinary infections, such as cystitis (prevents harmful bacteria adhering to the walls of the bladder or urinary tract). Typical preparation: powder, tablet, juice. Contraindications: not recommended for those suffering from kidney disease without professional advice. Actions: anti-inflammatory, pain-relieving, sedative, digestive stimulant. Therapeutic uses: arthritis, gout, stiff joints, back pain, skin inflammation, sores and boils. Traditional South African remedy for digestive problems, especially gall bladder or stomach. Typical preparation: decoction, tablets, liquid tincture. Contraindications: not to be taken during pregnancy or by people with a stomach or duodenal ulcer. Actions: female tonic, phytoestrogenic (plant ingredients that resemble the action of oestrogens). Therapeutic uses: irregular menstruation, PMS, menopausal symptoms, cramps, restores health after childbirth, blood tonic. Typical preparation: tablet, liquid tincture. Contraindications: not recommended during pregnancy or for those with diabetes. High doses (over 500mg a day) may cause abdominal bloating and changes in menstrual timing or flow. Source: roots, flowers and seeds. Actions: immune-boosting, anti-inflammatory, antiseptic, antiviral, antibacterial, anti-allergenic, detoxifying. Therapeutic uses: to prevent and fight infections, especially colds, flu, coughs and sore throats. Can be helpful for chronic fatigue syndrome, allergic conditions such as asthma and hay fever, shingles, herpes and mouth ulcers, or applied topically for eczema, boils or acne. Typical preparation: tablet/capsule, liquid tincture, cream, decoction (gargled for sore throat). Contraindications: rare, but high doses (over 1,000mg) can sometimes cause dizziness or nausea. For the best effect, it shouldn't be taken for more than one to two weeks at a time. Therapeutic uses: eye tonic for eye irritation or infections such as conjunctivitis, sties and eyestrain. Also used internally for sinusitis, catarrh, sore throats and hay fever. Typical preparation: tablet, decoction or liquid tincture. Contraindications: none known, although its safety during pregnancy hasn't been proven. Source: leaves and aerial parts. Actions: reduces fever, pain-relieving, anti-rheumatic. Therapeutic uses: migraine, irregular or painful periods, joint inflammation and pain, fevers, childbirth. Typical preparation: fresh leaves (eaten or made into a tea), tablets/capsules, liquid tincture. Contraindications: not to be taken during pregnancy or if taking warfarin or any other blood-thinning medication. Eating the fresh leaves can trigger mouth ulcers in some people. Actions: antibacterial, antifungal, antiparasitic, anti-inflammatory, reduces cholesterol, helps to balance blood pressure. Therapeutic uses: colds, flu, coughs, sinusitis and chest infections, candida albicans, high blood pressure and heart disease, circulatory problems, skin problems including acne and impetigo, blood sugar regulation, digestive infections. Typical preparation: eaten raw or in food, rubbed on skin, tablets or capsules. Contraindications: not to be taken with anti-clotting medication. If you're breastfeeding, you may find that garlic makes your baby's colic worse. Source: rhizome, which contains high levels of ginger oil. Actions: anti-emetic (stops nausea), anti-inflammatory, warming, circulation stimulant, digestive tonic, antiseptic. Therapeutic uses: travel sickness, morning sickness or nausea, indigestion, colds and flu, chilblains and arthritis. Also helps to lower blood pressure. Typical preparation: eaten raw or cooked, infusion, capsules, ginger gum, liquid tincture, essential oil. Contraindications: not to be taken by those suffering from peptic ulcers. The essential oil shouldn't be taken internally without professional supervision. Long-term use in pregnancy isn't recommended. Actions: antioxidant, anti-allergic, anti-inflammatory, circulation stimulant, improves memory and general mental function. Therapeutic uses: poor memory and concentration and impaired mental function, high blood pressure, stroke, varicose veins, piles, asthma, wheezing. Typical preparation: tablet/capsule, liquid tincture, infusion. The nuts are eaten as a delicacy in the Far East for improving memory and easing wheezing. Contraindications: high doses (over 120mg a day) can cause headaches. Not usually recommended for children and not to be taken by those on blood-thinning medication. Actions: immune booster, tonic, stimulant, adaptogenic (improves tolerance to physical, mental and environmental stresses). Siberian ginseng isn't technically a member of the ginseng family, but it has very similar properties and is widely used. Therapeutic uses: stress, nervous exhaustion, insomnia, depression, poor memory and concentration, chronic fatigue syndrome, jet lag. Typical preparation: decoction, tablets/capsules, liquid tincture. Best taken early in the day. Contraindications: not to be taken with coffee or for more than six weeks at a time. Avoid if pregnant or have high blood pressure. Unsuitable for children. Source: fresh or dried rhizome. Actions: antibacterial, antifungal, anti-inflammatory, tonic, astringent, mild laxative, uterine stimulant. Therapeutic uses: traditional Cherokee remedy for wounds and ulcers. Used for digestive disorders such as heartburn, dyspepsia and indigestion, catarrh, ear, mouth, sinus and throat infections, PMS and menstrual discomfort, urinary infections and candidiasis (eg, thrush). Typical preparation: decoction (as a gargle for sore throats), capsules, liquid tincture. Contraindications: not to be taken if pregnant, breastfeeding or suffering from high blood pressure. Actions: antioxidant, relaxant, improves circulation, dilates blood vessels. Therapeutic uses: heart disease (including angina and coronary artery disease), high blood pressure, poor memory, nervous tension, insomnia. Typical preparation: tablets, decoction, liquid tincture. Contraindications: those with heart disease and pregnant or breastfeeding women should seek professional advice before taking hawthorn. Therapeutic uses: urinary infections such as cystitis, water retention, rheumatism, chest problems. Typical preparation: tablets, infusions, douches. Oil from the berries is used for chest problems; the oil from twigs is used for skin conditions. Contraindications: avoid if pregnant. Don't use internally for more than six weeks. Actions: protects liver, increases bile secretion, antioxidant, increases production of breast milk. Therapeutic uses: liver disorders including hepatitis, cirrhosis and jaundice, PMS, candidiasis, psoriasis. Typical preparation: capsules, decoction, liquid tincture. Source: aerial parts and roots. Actions: diuretic, astringent, tonic, anti-inflammatory, prevents haemorrhages, cleansing, detoxifiying. Therapeutic uses: elimination of waste products, arthritis, gout, urinary problems, hay fever, allergies, eczema, bleeding, ear, nose and throat problems. Typical preparation: infusion, decoction, tincture, ointment. Source: aerial parts and flowers. Therapeutic uses: anxiety, stress, insomnia, cramps, toothache, menstrual pain, headache. Typical preparation: infusion, tincture, tablets. Contraindications: can cause drowsiness, so caution is needed when driving or handling machinery. Avoid high doses (over 250mg a day) when pregnant. Actions: relieves muscle spasms, antiseptic, increases sweating, stimulates bile secretion. Therapeutic uses: digestive problems, especially indigestion, heartburn, colic and flatulence. Also helps nausea, tension headaches and migraine, respiratory infections, fevers and travel sickness. Typical preparation: infusion, capsule, essential oil. Contraindications: not suitable for pregnant or nursing women, or children under 12. The essential oil shouldn't be taken internally without professional supervision. Actions: expectorant, antispasmodic, phytoestrogenic (plant ingredients that resemble the action of oestrogens). Therapeutic uses: coughs, bronchitis, eczema, sores, scrofula (TB of the neck) and as a gargle for mouth ulcers and sore throats. Also relieves menopausal symptoms. Typical preparation: tablets, liquid tincture or infusion. Contraindications: should be avoided by pregnant and breastfeeding women. Source: flowers and aerial parts. Actions: antidepressant, sedative, antispasmodic, antiviral, antibacterial, astringent. Therapeutic uses: depression, anxiety, insomnia, viral infections, menstrual cramps, menopausal stress, insect bites,burns, neuralgia, cramp. Typical preparation: capsule, infusion, liquid tincture, cream. Contraindications: can cause light sensitivity, so exposure to sun should be avoided. Not to be taken with the contraceptive pill, anti-epilepsy treatments and a number of other medications including antidepressants. If you're taking any medication, consult your doctor before starting St John's wort. It also shouldn't be taken with foods containing tyramine, such as cheese, red wine, preserved meats and yeast extracts. Actions: anti-inflammatory, diuretic, antiseptic, blood cleanser, detoxifier. Therapeutic uses: skin problems, especially irritated skin, psoriasis and eczema, rheumatism. Typical preparation: tablets, infusion, tincture. Actions: sedative, tonic, diuretic, anabolic. Therapeutic uses: urinary problems, prostate problems, impotence and low libido, building up the body. Typical preparation: tablets, infusion, decoction. Actions: tonic, adaptogenic (restores the body's ability to heal itself), liver protector. Therapeutic uses: liver problems such as hepatitis, stress, anxiety, insomnia, allergic skin conditions such as hives, recovery after surgery, aids athletic endurance, improves sexual function. Typical preparation: berries can be chewed or made into infusion, tincture, decoction or capsules. Contraindications: occasionally causes heartburn. Some studies suggest that epileptics and those with hypertension should avoid it or use it with great caution. Actions: nutrient, antifungal, antibacterial, anti-inflammatory, laxative, emollient. Therapeutic uses: digestive problems such as indigestion, gastritis, ulcers, dyspepsia, colitis, constipation and irritable bowel syndrome. Also used for sore throats, bronchitis, coughs, urinary problems and skin conditions such as boils. Typical preparation: infusion, capsules, poultice. Therapeutic uses: urinary tract disorders such as cystitis, urethritis, vaginitis, fluid retention and bedwetting. Also profuse bleeding during menstruation, diarrhoea and toothache. Typical preparation: tablet, infusion, decoction. Contraindications: not to be used during pregnancy or while breastfeeding. Shouldn't be used for more than two weeks at a time without professional supervision. Higher doses occasionally lead to nausea. Actions: relaxant, sedative, relieves anxiety and spasms, lowers blood pressure. Therapeutic uses: insomnia, nervous tension, stress, neuralgia, PMS, menstrual cramps and high blood pressure. Typical preparation: tablets, decoction, tincture. Contraindications: can cause drowsiness. Shouldn't be taken with sleep medication. Actions: anti-inflammatory, antispasmodic, anti-rheumatic, increases sweating, diuretic. Therapeutic uses: traditional north and central American native remedy for painful periods, cramps and labour. Also used for menopausal symptoms, arthritis and rheumatism, joint inflammation, colic, irritable bowel syndrome and muscle spasms. Typical preparation: tincture, cream, decoction. Contraindications: not to be taken during pregnancy. Please note: every effort has been made to ensure that the information and guidelines in these lists was correct at the time of launch (October 2002). However, information and recommendations change periodically in the light of new findings and best use may vary from person to person. Therefore it's always advisable to consult a qualified practitioner for advice.